We recently ran across a mystery: This Buren Calibre 82 wristwatch boasts an unknown 36,000 A/h movement and ambiguous date of production. What is it? We unravel the mystery and recommend a buy! 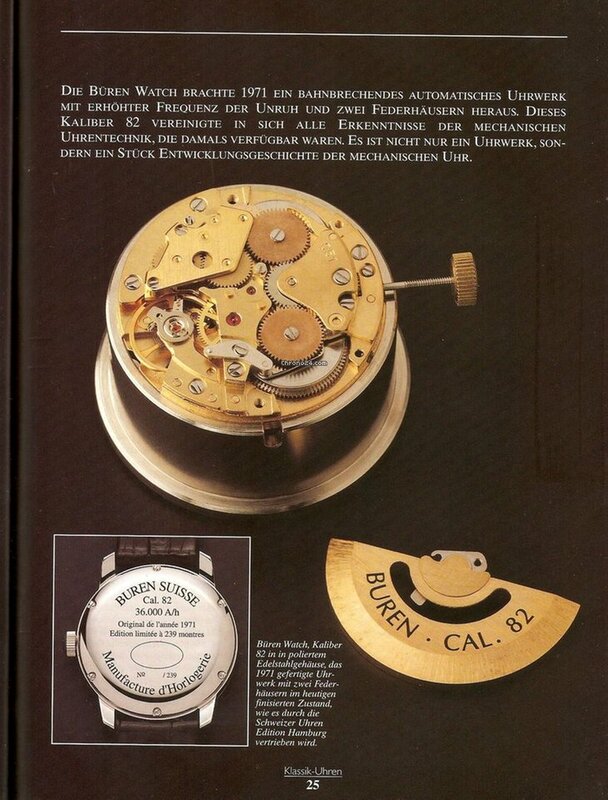 Read more about the Buren Calibre 82, including translations of the manuals and a detailed book about this movement. It is marked with the famed “Buren” name. Buren was one of the chief innovators in automatic watches, developing and patenting the micro-rotor concept, and was part of the Chronmatic team that delivered one of the first automatic chronographs in 1969. But Buren was purchased by Hamilton and “went dark” in 1971, being sold off to the German Comor company. It includes “Calibre 82” and “36,000 A/h” right there on the dial, suggesting it is one of the very few high-beat watches ever produced. But it’s not mentioned in many of the online roundups of high-beat movements! On the rear, the watch specifies “Original de l’année 1971”, suggesting that this watch is originally from 1971 but was not issued that year. 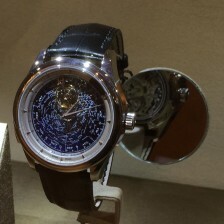 It also includes “Edition limitée à 239 montres” and “N 123/239”, telling us that this was a limited edition of just 239 pieces. We also get another proud proclamation “Buren Suisse” and “Manufacture d’Horlogerie”, telling us this is a Swiss-made watch from a full “manufacture” known as Buren. But this does not match the original Buren company look. I did some further research and think I have turned up the story of this interesting watch. The American Hamilton company purchased Buren in 1966 and rapidly transitioned to Swiss manufacturing. But the quartz crisis loomed just a few years later and the Buren/Hamilton partnership collapsed. In 1971, Hamilton sold off Buren and all of its assets and the company was shut down. But Buren had already been working on a new high-beat movement to compete with the high-end work from companies like Zenith, Seiko, Girard Perregaux, ETA, and the rest. The culmination of this project was the Calibre 82, but only a few movements (perhaps as few as 250) were ever made before the company was liquidated. These were sold to Comor. 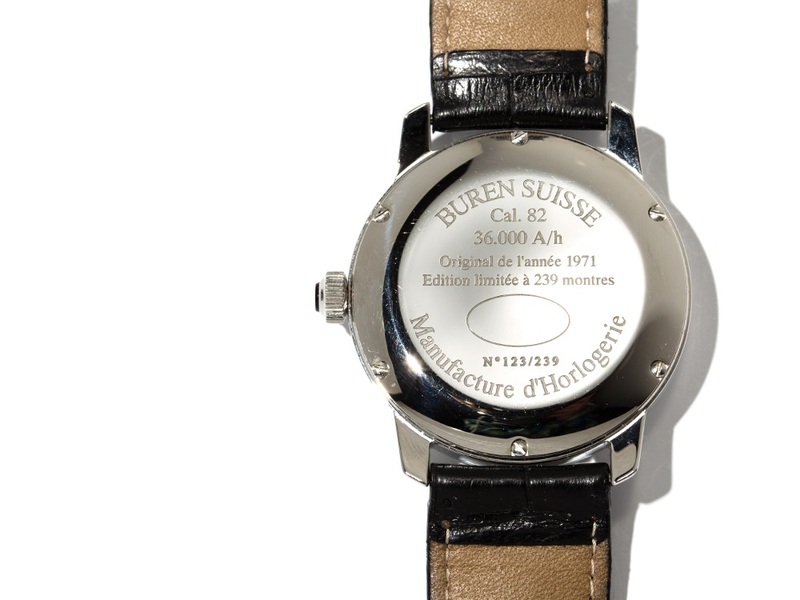 Another company, Schweizer Uhren-Editionen, acquired the Buren name and assets and in 1998 issued this watch, the “Buren Calibre 82”, using those movements. They still produce and sell Buren watches today, though these “new old stock” movements are long sold out. Calibre 82 is a thoroughly modern movement, with two barrels for power, hacking seconds, quickset date, fine adjustability, and KIF shock protection. According to an archive of the company’s 2002 web site, this movement was quite special indeed: It achieved a Chronometer Index of 4.4 in 1970, making it the most accurate mechanical movement ever certified! It achieved a variance of between +15 and +60 seconds per 30 days, far exceeding the test parameters. 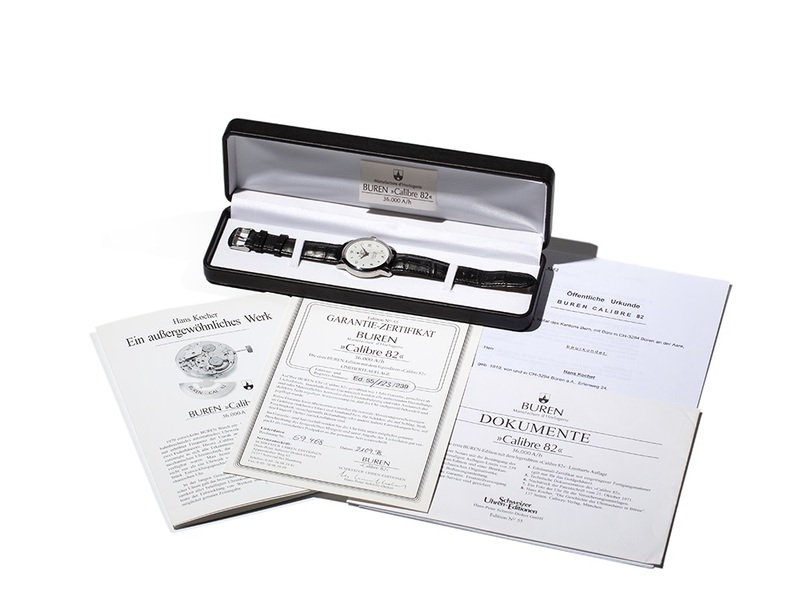 This particular watch includes all of the paperwork and appears to be in excellent condition. It is on offer for a starting bid of € 400, and we intend to bid on it. As is typical of Auctionata’s listings, just about every detail is wrong, from the date to the description. But this is the real truth! This can be thought of as the final output of the famed manufacturer. 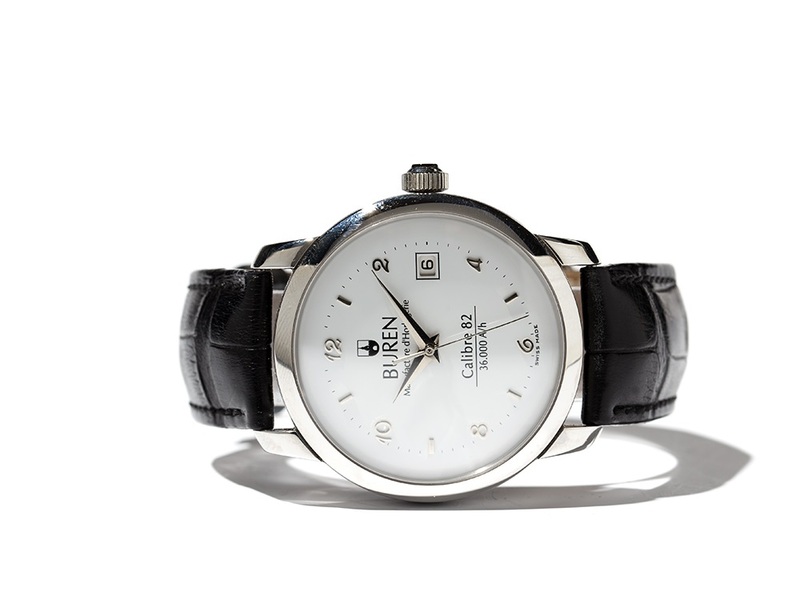 A second Buren Calibre 82 in steel is also on offer at Chrono24, this time for an unlikely € 1,989. This includes further details, including the original retail price of this steel watch as 4,945 Deutsche Marks, or approximately $3500. It also includes the following advertisement for this movement. Have one like this. Thanks for your research on the history of this masterpiece! I am the designer and co-inventor (with H.Kocher) of the mouvement Büren 82. I am 72, retired and I still have 4 prototypes of the calibre Büren 82. Are you interested in buying one of them? Thank you for your comment, Herr Gygax! I hope I have gotten the details of your movement correct, since it is based on recent research and not historic knowledge! I would love your feedback on all this!